Stereoscopy in space is the spatial 3-D or “stereo” observation of related 2-D images, showing the same object under different viewing angles. The Earth stereo images from orbit enable map-making for civil and military applications, such as flight simulators. The image combination of a target area may either result from three cameras pointing into the forward, nadir and aft directions, respectively, of subsatellite track, or from a single gimbaled camera, performing along-track imaging by pointing into the forward, nadir and aft directions successively, or from single fixed camera by successive slant of its point of view by turning a scanning mirror or the satellite itself. The DUSAT project consists of two identical Low Earth Orbit (LEO) microsatellites, designed for simultaneous three-dimensional mapping. This system is an attractive alternative to traditional large single satellites for Earth stereo observation missions. Small satellite low cost technologies, rapid delivery satellites for new constellation, high level redundancy, twin satellites orbital operation and ground station were examined in the DUSAT project. The project demonstrates that the approach of microsatellites in constellation can challenge the schedule, cost, reliability, simplicity and stereo imaging properties of a large satellite solution. Each microsatellite of the DUSAT system has a mass of 95 kg. The two satellites occupy the same sun synchronous orbit, with altitude of 550 km, with local time of descending node at 10:30 AM. The distance between the satellites is 394 km, and this forms the stereo basis for Earth imaging. 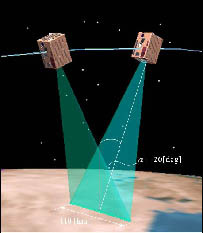 The swath of cameras, that photograph the same Earth area from the satellites, is 110 km, and the spatial resolution is 10 m. A simple attitude control system without heavy moving mechanic actuators, using only the Earths magnetic field, provides needed accuracy of satellite stabilization. The images are transmitted to the ground station at Kiruna (North Sweden). The lifetime of the DUSAT system is 3 years, with reliability of 0.8. The cost estimation of the whole system (development and operation) is M$32. Simple vertical photography, mainly used for 2D mapping. Oblique photography, when operating only one satellite. 3D imaging, using two 2D oblique images. The innovation of the present project is its ability to achieve 3D photos using only two low cost microsatellites. Therefore the DUSAT satellites design was restricted in weight, power and dimensions. COTS, miniature components were widely used and new space design approaches were examined throughout the project.